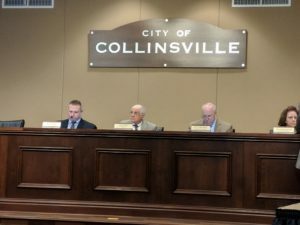 On Monday, March 12, the City of Collinsville voted to include the City’s municipally owned electricity accounts with the Collinsville Chamber of Commerce’s Bulk Electricity & Natural Gas Buying Group,. By doing so, the City of Collinsville will see an immediate reduction in electricity supply rates of nearly 20% resulting in savings of a minimum of more than $20,000 annually. The Collinsville Chamber’s Electricity & Natural Gas Buying Group is an aggregate of chambers of commerce organizations throughout Southern Illinois and the metro-east, leveraging their members’ electricity supply usage into large pools that are collectively shopped to the lowest bidder. Southern Illinois based Affordable Gas + Electric (AGE) manages the collective pool of electricity accounts on behalf of the chambers and negotiates bulk rate discounts for all participating chamber members. AGE is a large aggregator of electricity and natural gas, managing some of the largest pools of both commodities in the State of Illinois. AGE currently manages nearly 100 residential aggregation programs and 20 commercial and industrial electricity programs for Chambers of Commerce and other Associations. AGE also manages the Illinois Schools Energy Management Group (ISEM). AGE is represented by David Spicuzza, Energy Consultant, for the Metro-East. David can be reached at (618) 214-6723 or at david.s@agellc.com. For additional information about the Collinsville Chamber of Commerce Electricity & Natural Gas Buying Group, please visit http://www.agellc.com/groups/.